This model from Samsung has a 28-inch display size that can be used with or without a stand; the monitor has the proper set up for a wall mount. It was originally stated that this would make a great first TV which is true. It is smaller and doesn’t have any overly complicated pieces while still giving you a nice image. It includes 2 HDMI ports and a single USB port. These are perfect for cable boxes or Blue Ray / DVD players. Its small size also makes it a good computer monitor by connecting your computers tower to the screen via USB. Gamers can use this as well. All consoles will be compatible since the monitor comes with a component, composite and an audio out port. The lack of 1080p resolution may sway gamers away from spending their money on it, however. With a resolution of 720p and an image aspect ratio of 16:09, the screen gives off a decent picture, especially when watching movies or shows. It has an LED Edge light backlight which allows the picture to be seen just as clearly in the middle of the day as they are at night. Without a stand, this television has a width of 25.3 inches, a height of 15.6 inches and a depth of 2.6 inches. These measurements will be useful if you want to mount the TV on a wall. With a stand, the TV is 25.3 inches wide, 17.1 inches high and 6.4 inches deep. Overall it won’t take up much space no matter which way it’s set up. 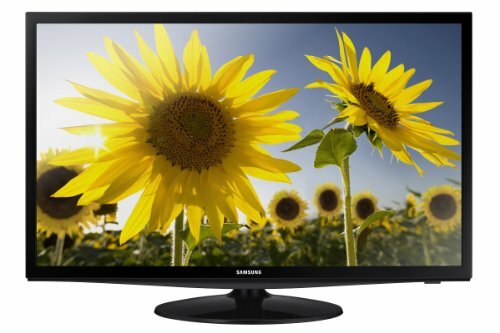 This Samsung model is sold at a decently low price compared to other televisions of the same size. It gives off rich colors, including deep blacks thanks to the backlighting, making anything you watch beautiful. The speaker system is adequate; extra speakers may be desired, but they are not necessarily needed. The sound quality is not extraordinary, but it is better when compared to other similar models. If you want to watch things like Netflix or Hulu, you will need a secondary device to do so. This particular model is not a ‘smart’ TV, meaning it doesn’t have internet connection on its own. All input ports are located on the back panel of the TV. When measuring the space for a TV such as this one in an entertainment center, make sure you allow for extra space along the sides so the built in fans can keep the monitor cool. If the TV is wedged in perfectly, there is a chance of overheating.